Okay, back to Patagonia for this week’s photo. This isn’t in my specific field area, but very close to it and in the same formation. What’s really cool about this area is the presence of clastic dikes….or, what have now been termed “injectites”, as in the injection of sand. 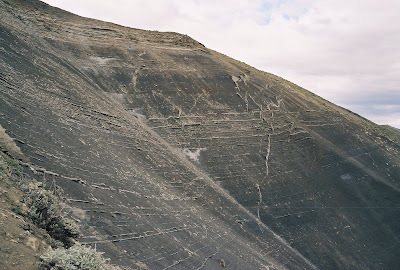 In this photo you’ll notice the light-colored streaks cutting up and to the right across the flat-lying strata. These features are sandstone. Injectites have been recognized for over a hundred years, but have been more appreciated in recent years. Oil companies searching for petroleum in the North Sea have seen huge networks and complexes of injectites with seismic-reflection data. And I mean huge…some of the individual sandstone “dikes” can be kilometers long cutting sub-vertically through the strata. In the case above, the orientation of this swarm of injectites are parallel to a growth fault (i.e., syn-depositional) lower in the section. There is still much debate about the mechanics of these things…what kinds of overpressures are required, how fast is the unlithified sand injected, and so on.